We were invited for lunch at our friends Donald and Emma’s yesterday. Donald Douglas of that ilk! He who gave up chasing me over the Cornish cliffs dressed as Captain McNeil years ago (sensible fellow) and settled down a few miles from us here in France. I’m always slightly wary of visits to Donald–never sure he hasn’t a troop of redcoats hidden in the stable–just kidding! Donald, apart from being a fine actor, is a talented gardener and an artist–happy experimenting in any medium. 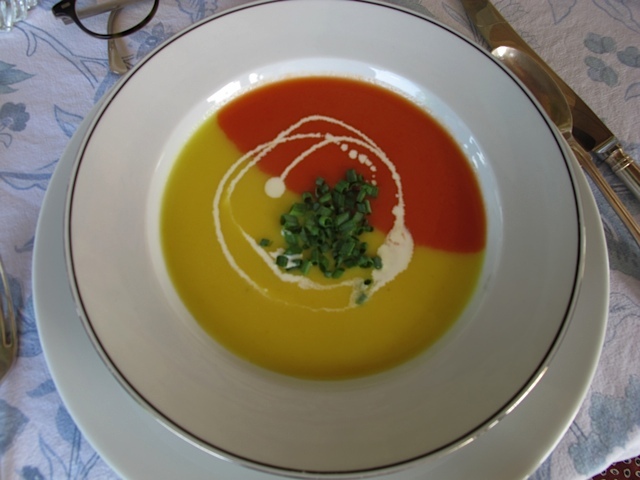 This is chilled Red and Yellow Pepper Soup with chives. Or is it a painting? In fact–it’s an edible action painting. 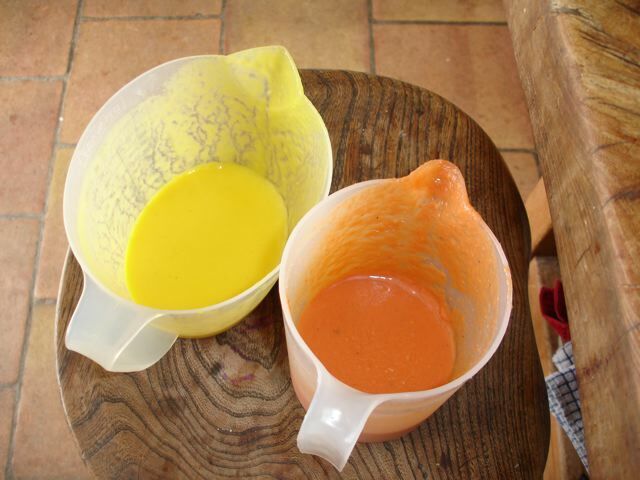 He makes the two soups–being careful they are of the same consistency–and fills two jugs. He chills them and when the guests are seated he starts to “paint”–pouring from both jugs at the same time. Amazing! Presentation can make such a difference! I’m going to have to try this! Loved Douglas’s character in Poldark. I was sorry he didn’t make an appearance in the second season. What a talent here too! Thanks for sharing! Finally: art that looks good enough to eat…..
By the way, Captain McNeil doesn’t need redcoats in his stable, it seems he already captured you with an artful lure…..
Every hero has a weakness…. 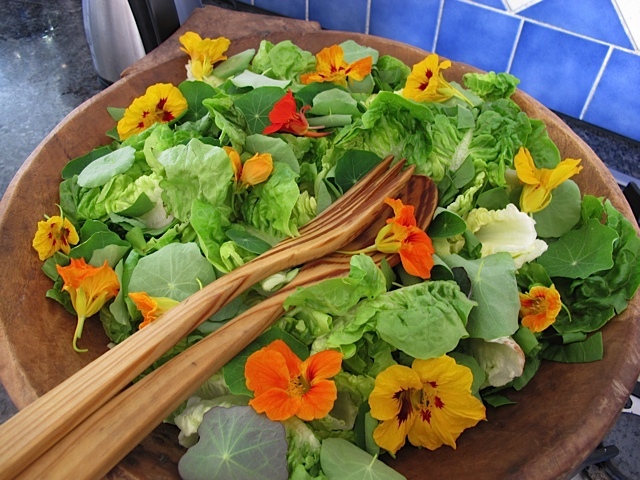 The Nasturtium salad also looks very beautiful. I love the peppery bite of the flowers and they are very easy to grow! A beautiful (and I should imagine tasty) meal. It’s womderful when friends go to so much trouble. love soup, having seen this, my husband bought me the blender I had loged for. So far he is the sole user being more electrically tallented than i am. I am envious! 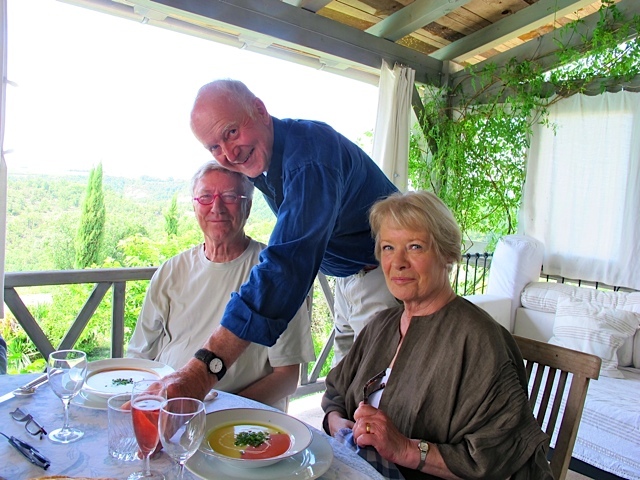 Two dashing ‘captains’ serving delicious, healthful meals in the South of France – what more can one want!